What can you do with your tropical plants in the garden to protect them during winter? It all depends on what you have. Bananas are probably some of the most popular tropical perennial plants grown in our Triangle gardens. To give them extra protection from the cold, build a cage. The idea is to maintain a tall trunk from which new leaves will emerge next spring. Begin by cutting off all leaves down to the trunk after a good frost has blackened them, keeping the trunk about 4 feet tall. The cage should be made of a hard wire that will remain sturdy all winter. Support it with rebar to keep it standing. Push the rebar into the ground and rap the wire horizontally around the rebar, two feet from the outer most trunks or trunk and secure the wire. Fill the space with dry, shredded leaves all the way up to the top so that the trunk is completely covered. When spring hits, and it’s finally warm enough for the new leaves to emerge, remove the cage and use the leaves to mulch the garden. Cannas, elephant ears and ginger lily (Hedychiums) are pretty tough and don’t necessarily require the full treatment as the banana in the Piedmont. It wouldn’t hurt, however, to add a fresh layer of compost or mulch at the base after the frost has bitten the leaves and you’ve cut them off to about one foot above the ground. New growth will form from the base of the plant when spring arrives. It’s important to know what you have, and if it’s suitable to survive our winters, especially with elephant ears; there are many on the market and not all are hardy. 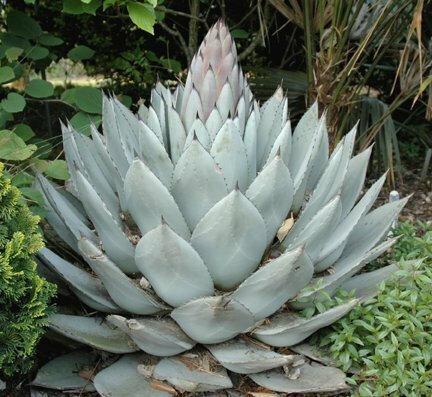 When it comes to Agaves, again, know what you have, and know your garden. The winter hardy ones won’t need special protection, but you will need to be sure that you’ve sited them correctly in the garden, ensuring good drainage by using scree material, a course stone, in the soil. Make sure these are planted in a 6-inch or more raised bed. Cold won’t be as damaging to the plant as moisture. There may be some winter damage by way of blackened leaves, but those can be cut back in spring. For those with non-cold hardy Agaves, bring them indoors. I situate mine in a well-lit room, and offer very little water throughout the winter. Using a good porous potting soil with little peat moss is best for these prickly pets, since they don’t like their feet wet. For traditional houseplants, such as peace lilies, ficus, dieffenbachia and birdsnest fern, bring them inside before night temperatures fall consistently below 50°F. A fair number of plants can withstand below that mark before being damaged, but 50°F is my personal cut-off temperature. There are a number of local sources available for checking the specific requirements for your potpourri of plants. Finding room inside is always a challenge for me because I have so many plants that need the prime real estate at a windowsill. My begonia collection sits at the kitchen window where they receive morning light and water from the sink only when the soil becomes dry. The rest of the motley crew receives the afternoon sun through the living room window; again, most only receive water when the soil dries out. Be prepared for a possible infestation of whiteflies or mealybugs. They’re more of a nuisance, but can cause damage if they get out of control. A simple solution of equal parts rubbing alcohol and water, dabbed on with a cotton swab usually does the job. A horticultural soap or oil application is also effective. Sandra Zazzara, a plant geek among her friends and family, considers her enthusiasm for plants an infectious addiction. At home, she enjoys gardening for pleasure, surrounding herself with beautiful and unusual plants; she also volunteers at the JC Raulston Arboretum in Raleigh.